Angry Indian Goddesses is a feminine movie with a realistic feel. The movie stars Anushka Manchanda, Sandhya Mridul, Sarah Jane Dias, Tannishtha Chatterjee, Pavleen Gujral Amrit Maghera, and Rajshri Deshpande and is directed by Pan Nalin. The film that offers a realistic view about the problems of women was released in theatres on 4th Dec 2015. Photographer Freida played by Sarah Jane Dias, invites her friends from college to her family home in Goa. The all girl group includes Suranjana who is a CEO, Joanna, who is an aspiring actor, Madhureeta, who is a struggling singer, Nargis, who is a social activist and Pam, the trophy wife, played by Amrit Maghera, Sandhya Mridul, Anushka Manchanda, Pavleen Gujral and Tannishtha Chatterjee respectively. Taking care of the house and Frieda’s friend is the maid Lakshmi played by Rajshi Deshpande. The women spend time together, mostly having fun and even tease and complain about each other. But at times they are also pulled down by the depression of their personal battles fought on a daily basis. Angry Indian Goddesses is a movie that most females can identify with. From struggling to be successful in a male dominated society to bearing the lecherous looks and dirty remarks of eve-teasers it tells a tale of every day struggles faced by women form all sections of society. The best aspect of the movie is that Nalin has been successful in retaining the realistic feel of the movie by avoiding going down the raod of providing didactic and clean solution to these problems. 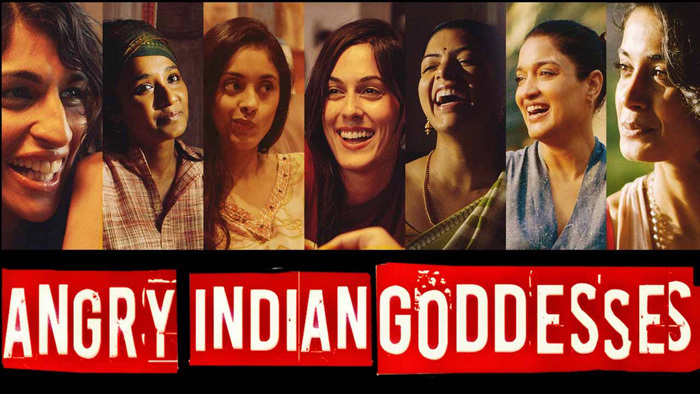 Angry Indian Goddesses is a good movie as it has strong positive vibe that celebrates pure friendship and IndiaCafe24 gives it a rating of 3.0 stars.